Looking for a free WordPress theme to give your business site a professional look? You might want to check out Integral, in that case. This theme allows you to display everything in an elegant manner that will leave your visitors with a positive impression of your business. It has been tested to work well with a number of useful plugins such as Contact Form 7, WooCommerce, Elementor Page Builder, and more. 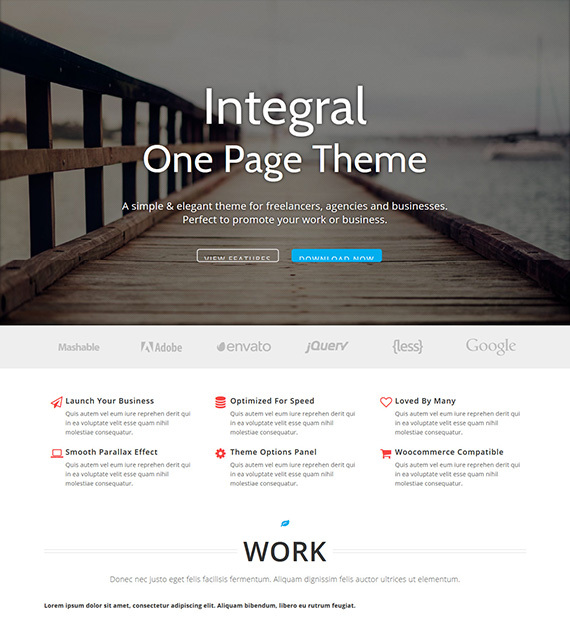 With Integral, you will be able to create a beautiful One Page site, complete with smooth parallax effect. Add a brief content about yourself, your company, and your mission in your website homepage. The ‘About Us’ layout provides you a beautiful way to do that.